LIMA, Dec 12 2014 (IPS) - Snow-capped mountains may become a thing of the past in Peru, which has 70 percent of the world’s tropical glaciers. And farmers in these ecosystems are having a hard time adapting to the higher temperatures, while the governments of 195 countries are wrapping up the climate change talks in Lima without addressing this situation facing the host country. Some 100 km from a glacier that refuses to die – the Salkantay mountain in the department of Cuzco – there is a monument to passion fruit, which hundreds of local farmers depend on for a living, and which they will no longer be able to plant 20 years from now, according to projections. 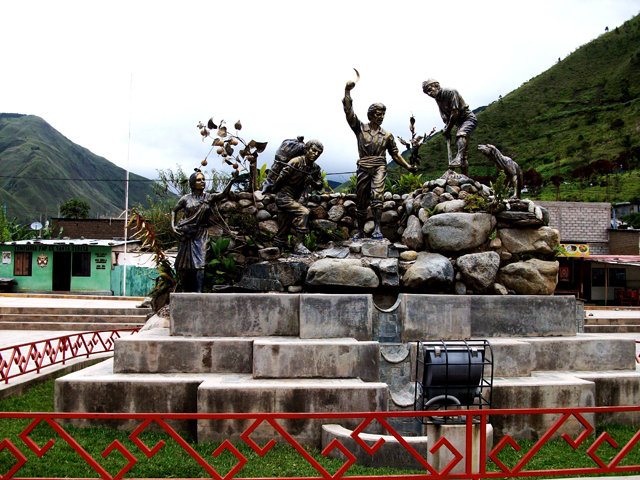 The monument, which is in the main square in the town of Santa Teresa, near the famous Inca ruins of Machu Picchu, shows a woman picking the fruit and farmers carrying it on their backs, cutting the weeds, and hoeing. That scene frozen in time reflects real life in Santa Teresa, where passion fruit (Passiflora ligularis) grows between 2,000 and 2,800 metres above sea level. But due to the rising temperatures, farmers will have to move up the slopes. And once they reach 3,000 metres above sea level, they won’t be able to plant passion fruit anymore. “There is a strong impact in this area because the locals depend on the cultivation of passion fruit for their livelihoods,” environmental engineer Karim Quevedo, who has frequently visited the Santa Teresa microbasin as the head of the agro-meteorology office of Peru’s national weather service, Senamhi, told IPS. That microbasin is one of the areas studied by Senamhi as part of a project of adaptation by local populations to the impact of glacier retreat. 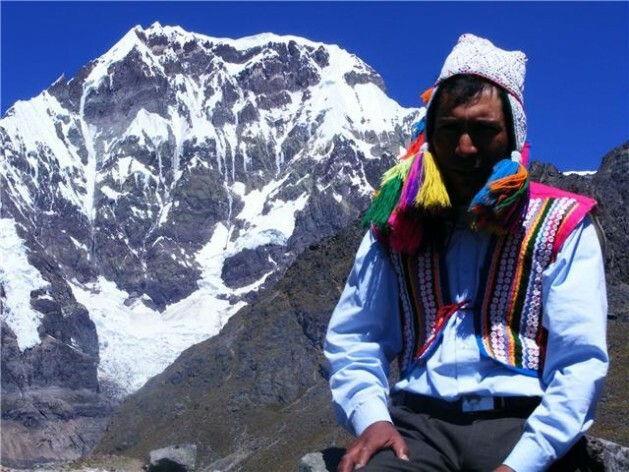 The glacier that is dying next to the town of Santa Teresa is Salkantay, which in the Quechua indigenous language means “wild mountain”. Salkantay, at the heart of the Vilcabamba range, supplies water to local rivers. But in the last 40 years the glacier has lost nearly 64 percent of its surface area, equivalent to some 22 sq km, according to the National Water Authority (ANA). “It’s important to assess how the retreat of the glacier affects the local population, to know how they can adapt, because the loss of these snow-capped peaks is irreversible,” the head of the climate change area in ANA, Fernando Chiock, told IPS. Both Chiock and Quevedo said it was crucial to take into account the direct effects on the local population and to prioritise funding to mitigate the impacts, at the end of the COP20 – the 20th session of the Conference of the Parties to the United Nations Framework Convention on Climate Change (UNFCCC) – whose final phase was attended by leaders and senior officials from 195 countries. COP20, which began Dec. 1, was scheduled to end Friday, but is likely to stretch to Saturday. “What is yet to be seen is how to bring what is agreed at this climate summit to the ground in local areas. One of the challenges is to form connections between the big treaties,” Quevedo told IPS in Voices for the Climate, an event held near the military base in Lima, known as El Pentagonito, where COP20 is being held. The outlook is alarming, experts say. Since the 1970s, the surface area of the 2,679 glaciers in Peru’s Andes mountains has shrunk over 40 percent, from more than 2,000 sq km to 1,300 sq km, said Chiock. Some glaciers have already completely disappeared, such as Broggi, which formed part of the Cordillera Blanca, the tropical mountain range with the greatest density of glaciers in the world, which like the Vilcabamba range forms part of the Andes mountains. Around 50 years ago, Broggi was retreating at a rate of two metres a year, but in the 1980s and 1990s the pace picked up to 20 metres a year. In 2005, monitoring of the mountain stopped because the surface of the glacier, equivalent to signs of life in a human being, disappeared completely. Today, glacial retreat in Peru ranges between nine and 20 metres a year, according to ANA. At the same time, the melt-off has given rise to nearly 1,000 new high-altitude lakes, Chiock said. In the short-term, the appearance of new lakes could sound like good news for local populations. But according to the ANA expert, these new sources of water must be properly managed, to avoid generating false expectations in the communities and to manage the risks posed by the lakes, from ruptured dikes. Chiock explained that safety works are currently in progress at 35 lakes that pose a risk. There is a sense of uncertainty in rural areas. New lakes appearing, glaciers dying, hailstorms destroying the maize crop, unpredictable rainfall patterns, heavy rains that affect the potato crop, intense sunshine that rots fruit, insects that hover like bubbles over a boiling pot. Some crops have been affected more than others. With the high temperatures, potatoes have to be planted at higher altitudes because they need cold nights to flourish. In some areas, coffee benefits from intense sunshine, but in others the plants suffer because they also need shade. The influence of the climate on crops is 61 percent, according to the World Meteorological Organisation. “These minor climate events are the ones that cause the greatest damage to the population, and they are the most invisible to the international community,” Maarten Van Aalst, the director of the Red Cross/Red Crescent Climate Centre, who took part in the COP20, told IPS. He said it shouldn’t take a hurricane sweeping away entire harvests, like in Haiti in January 2010, for governments to sit up and take notice. But hopes are melting that they will do so before COP20 comes to an end here in Lima.